Manali-Leh road | high road to..
Todays hindi expression : chakka jam . A sit down protest – with cars. Manali has come to a near stand still as the National Green Tribunal actually almost stod it’s ground on the issue of banning diesel traffic up to the Rohtang La pass. In the end the long forewarned decision was transformed in to a cap on the total number of vehicles , and a heavy tax on diesel vehicles. Little love was won by this compromise. * the Rohtang La biotope , crossed by the “Great White Snake ” : Thousands of four wheel drive cars , leaving a trail ..less than white behind them . Pristine white snow in beginning of the season turns more and more in to something resembling the floor of a oil pit in a auto shop. * the Manali taxi drivers , who rightly remarks that paying five thousand rupees won’t make the vehicle less of a burden for the environment. 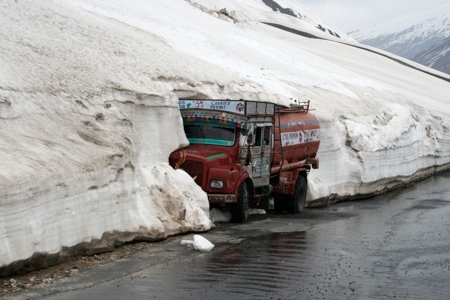 * the day tourists , many of whom have the chance of ” touching the snow” at the Rohtang as a key driving factor for coming to Manali . And now , when even the weather gods have been conspiring against them , found out yesterday that they can’t even come up to the snow line : the road always closes on Tuesdays so that Border Roads can do some effective road work. Right now the road past Marhi at 3000 meters is basically a one lane tunnel in the snow – see the photo in the sticky above. * the Lahaulis on the other side of the pass , waiting for the first fresh veggies and provisions in months since the road closed for the winter . 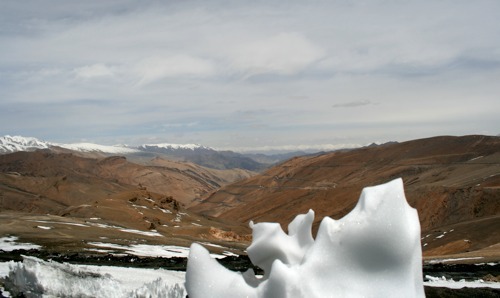 * the military , who hardly needs any advocates : the Manali-Leh road probably shouldn’t even exist without the backdrop of the Aksai Chin war and the tension between India and Pakistan. At least not as early as as in 80’s. Short term there are only two winners at the moment : the Lahaulis have a chance of seeing the road not being one of the slowest roads in India ( often five hours or more for the fifty-ish klicks from Manali to Rohtang top) in peak season. The other winners are the tourists who choose to stay and take the tour buses … until the taxi drivers block them as well. 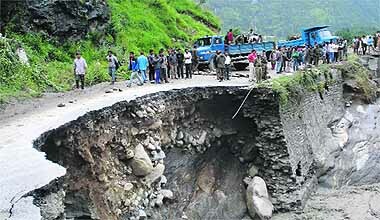 Long term the needs of the Army and locals will be solved by the Rohtang tunnel , but that’s years off still. The tunnel won’t make any real dent in the heavy traffic over the actual pass though , except in eliminating the heavy traffic nowadays the first week(s) after the spring opening. The mid term solution is more people in less vehicles , i.e. ( clean , CNG ) buses. Like the HRTC buses plying the full Manali-Leh road these need to be custom made : bigger than the minibuses , but still with short enough wheelbase to navigate the hairpin curves. The really bold move here would be going for a cable car ( rope way , as the Indians put it) . This would the litterally long term solution , since it would make Rohtang La a round the year safe attraction ,like the Jade Dragon. And yes , there is a common denominator here : the taxi drivers will suffer horribly. Sometimes everyone can’t win . Maybe this conflict will be a preparation for Delhiites in what must come at home as well : Delhi has one of the best Metros in the world – and this isn’t enough. It also has some of the foulest air in India ( and Asia , worse than Beijing ) , and this won’t change until the traffic situation changes drastically there as well. Cloudburst in epic proportions taking out bailey bridges , a school , the life of a Manali resident and tossing boulders and vehicles downstream Beas river yesterday.The road the southern port of the Solang tunnel work beyond repair for the coming weeks. Manali-Leh out in five different places . Heavy rainfall for the coming two days in forecasts. UPDATE , August 8th . That was fast :Traffic now running ( despite BRO´s first comment it would take “at least a week” to get it back in full order) to Keylong & Kaza. Moderate rain four out of five coming days. …and a farewell to the old familiar roadmarker at leh.nic.in : five hours later the old version of the site still not updated. Get used to the new minimalist look. See the recent photo posts and the Inroads 2012 post for details up to now. Thanx , raftinkiwi , one of the first to ride from Leh to Manali this year. 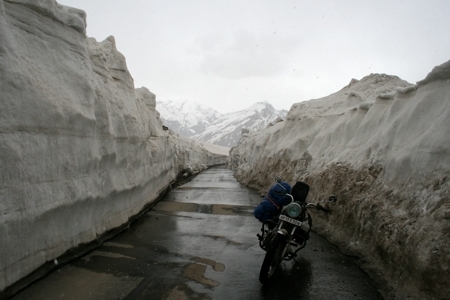 Photo from Gregor, one of the first to ride down to Manali from Leh this year. Keep ém coming , raftinkiwi !